Advances in digital imagery have given veterinary medicine better ways to treat ear problems. The superior magnification and longer length of the video otoscope allows us to see better and further into the ear canals of pets. 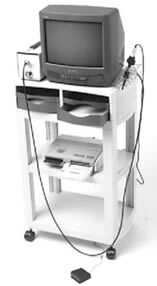 In 2003, The Ear Clinic for Pets invested in a video otoscope system to take advantage of the superior diagnostic and treatment option it provides. It has helped tremendously for pets with chronic ear problems and allows us to more accurately perform ear exams, diagnose diseases and treat external and middle ear problems. We have also used the system for visualizing the mouth cavity, especially on rabbits and chinchillas. At present, The Ear Clinic for Pets is the only practice offering this technology in Hillsborough county, New Hampshire. Dr. Michael Dutton, founder of the Ear Clinic for Pets, is a Board Certified Canine and Feline Specialist with 20 years experience treating ear infections in pets.